Hello everyone ! This is my turn to talk about me at this time. 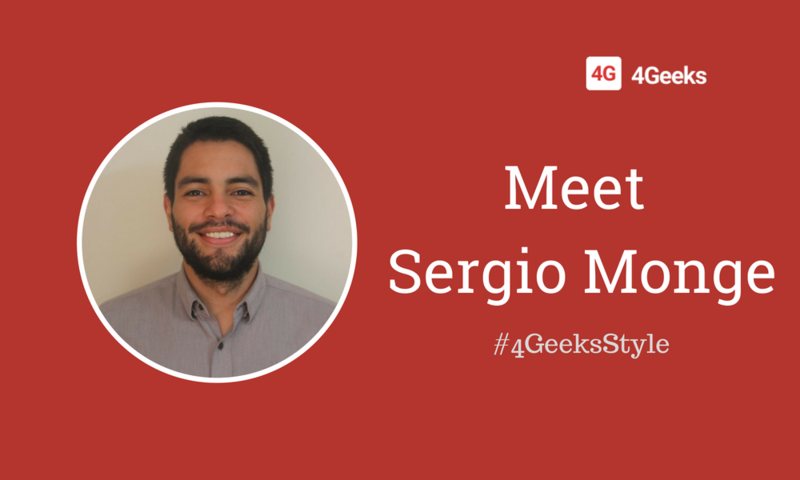 I’m Sergio and I’m CTO at 4Geeks, a role that I really enjoy. I like to help people to make the software of their dreams. using disruptive and top notch technology. Personally I love to talk to people, create empathy with them, talk about different topics but also understand ideas. I’m from Cartago, which is nearly to the capital. Cartago was the first capital of Costa Rica, there is not much things to do in my province, so I decided to move to San Jose. I like to read a lot about technology, classical literature and also comic books. Though the read I think I got the capability to understand different realities, different opinions and different points of view, which I applied every day to my work at 4Geeks. I see myself as a communicative persone, I like to talk but to listen. I am a very empathic with the ideas or thoughts of people, as long as these opinions do not discriminate against others. I like to keep learning about anything, have my own opinion on different aspects of life is something I try. I do not have much free time, but when I have it I definitely read or jus talk to my girlfriend about my day and so. I like mountain whether but I go too much frequently to the beach. I do triathlon, so almost every month I go to the cost. Of course, this is something I can really talk some time. I do triathlon and I’s something that I’m really passionate about. Actually I’m preparing myself for the next IronMan 70.3 Costa Rica . So my time is dived between 4Geeks and training for the competition. It’s amazing. I always enjoy metal, but I will say that I’m really open to any kind of music from Jazz to HipHop, for example. What I’m sure about is that Megadeth, Tool, A Perfect Circle and Pink Floyd are my top 4 bands of all the time. What is the most excited part of being CTO ? The way I can help clients but also teams. I involved on both sides I like to understand client ideas and needs and convert them into real products, 4Geeks brand products. I like how I can motivate teams to improve every day motivates me, I like to see people doing what they really love. Learn, learn and learn. Technology never sleeps and I need/enjoy reading, learning and researching new ways to code, delivery, manage and lead. The PEOPLE, We are talented bunch of people, the team are very emphatic with the different ideas and opinions and integral, we love to read, do exercise, talk about modern worlds, history. I also love the different internal projects We do, like 4Geeks Capsules (15-20 min talking about any tech topic) our Book Club, our 4Geeks Wellness Challenges, and relaxing with Yoga sessions. At 4Geeks my goals are share more and more content to return some of my knowledge to the community. I want to deliver education to people at socio-economic risk if you want to help, I’m here ! I’ll be participating on different congress around the US this year, so I hope to find more and more people to learn from, and apply knowledge gain to our client’s products. Personally, my goal is to classify to IRONMAN 70.3 World Championship in South Africa, but It’s a hard task to accomplish, nevertheless I’m training for hard for that. Well, that’s it for today. As you know I’m here to help everyone as possible, whenever you need guidance on how to start making ideas into reality though technology 4Geeks team is up and ready, just reach out to us at hello@4geeks.io.